This piece is simplistic in design and perfect for the cottage. The straight legs of this four posted bed conveys simplicity, but with a sturdy capability. No box spring is required as the mattress rests on a firm removable platform supported by the bed rails. 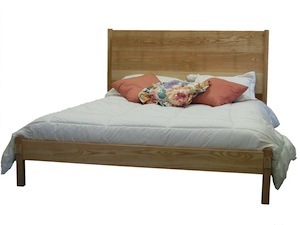 The Maine Cottage Bed header board can also come with gentle elliptical curved face (not shown). Please inquire about this option. The bed is platform in design. The platform is simply requires just your mattress. The size and thickness of your mattress should be provided at the time you order. Typically the height at the top of the mattress is set to about the height of a chair or around 18" to 20" If you desire to use a box spring this can be accommodated. Please inquire about making the proper adjustments to the bed frame for your box spring. Also if you prefer bed slats instead of a platform base, please inquire. There is a small additional charge for slats.